My niece Erica with a Northern Pike she caught while we were fishing in Onieda County. 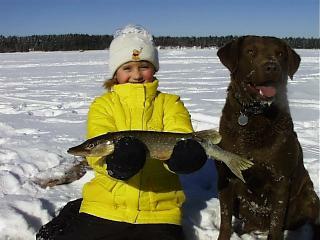 My other niece Kayla and my Chesie, Mercury, with one of the pike she caught on the same trip. The girls and Mercury are real troupers. 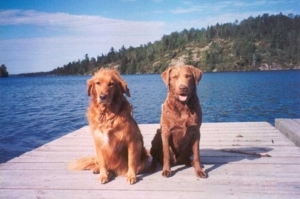 They enjoy fishing as much as I do. 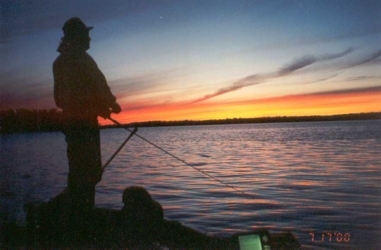 This Sunset silhouette was taken while fishing Lake of the Woods. This kind of stuf is almost as good as putting a fish in the boat! Erica and I when she caught her first musky, a 34 incher on a sucker she had been working all day! 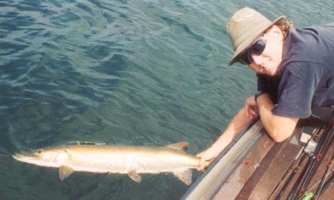 Releasing Erica's first musky. Teaching her the right way from the first time on! 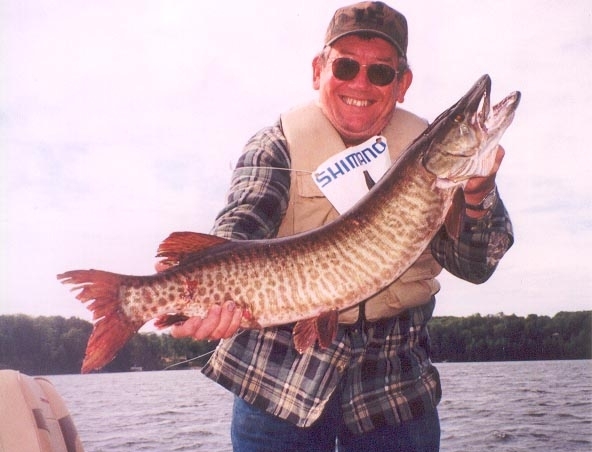 My brother, Doug, with a 35 incher he caught on Lake of the Woods. Those are his daughters pictured above. This fish was suspended with the nearest structure over 100 yards away! Our dad with a 35 incher he took while he and I were fishing the Minoqua Father's Day Tournament. 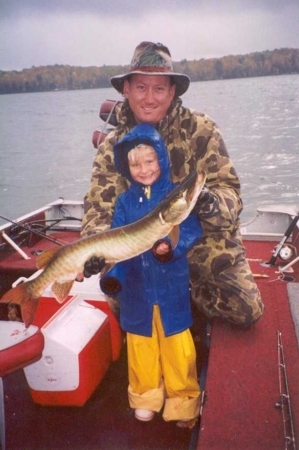 This fish is one of only two muskies caught in the Tournament! 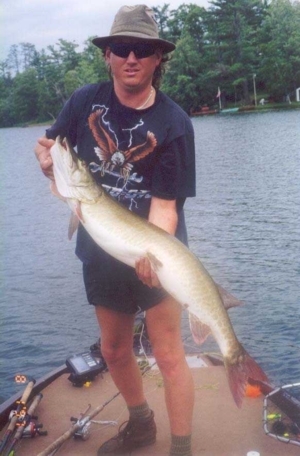 This is my first big musky. 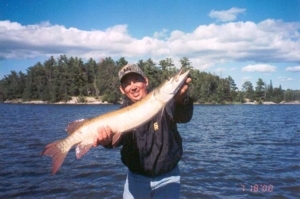 A Vilas County 44 incher! As you can see this was before I learned to take pictures without sunglasses. 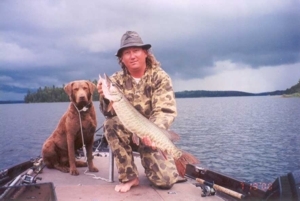 This is another Vilas County 44 incher. Still wearing the sunglasses!Notice the lucky shirt! I still wear it when I need extra forces!!! Now this is what a picture should look like! I wish I learned how to take pictures before I started musky fishing. 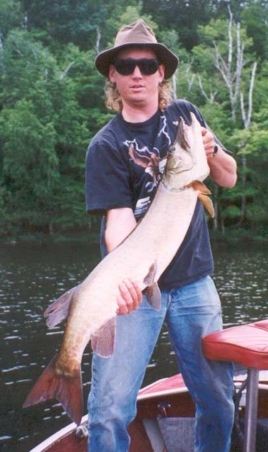 I caught this 35 inch fish in the 2000 National Championship Musky Open. 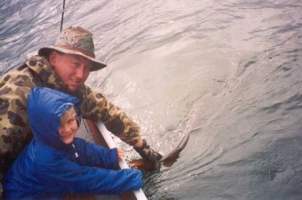 Kneeling helps make the fish look bigger, especially when your 6 feet tall.